Chris Palazzolo considers How to Train Your Dragon 2, Directed by Dean DeBlois, 2014. Anthony Lane, the film critic at The New Yorker, made the observation a couple of years ago, that this age will be remembered (among other things) for the flowering of the children’s animated movie. For most of the history of cinema, feature length animated movies were comparatively rare things. The technology of stop-motion where thousands of sequential hand painted stills, each one minutely different to the previous one, were run through a projector, was so labour intensive that only one company, Disney, had the capital to put one together. Just a single scene from Fantasia (say when Jove hurls the thunderbolt during the Pastoral Symphony sequence) would’ve taken hundreds of hours to produce, by a bank of highly skilled artists, organised like a medieval guild, each one paid a pittance. Other film production companies produced animations, but exclusively five or ten minute segments for television. During the later decades of the twentieth century, as industrial structures in Hollywood changed, the animated movie declined because labour costs became prohibitive. Only in Japan, where the wage-suppressing guild structure of their film industry survived did feature length animations continue to be viable. 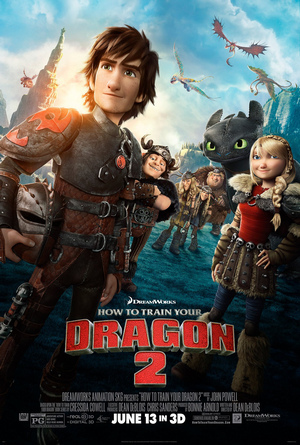 We now leap to 2015 and look at one of the more recent children’s animations, among the hundred or so released each year – How to Train Your Dragon 2. Here we are presented with a technological advance of such breathtaking rapidity only the mathematical concept of permutations can help us to grasp it. It’s as if the development of computer generated imagery (inaugurated in a feature film by Disney’s Tron in 1982) reached such a point of sophistication (sometime in the mid 1990s) that, like the command control computer network in Terminator, it suddenly started to think for itself, producing all manner of spectacular fractaling efflorescences of colour and movement which the humble human eye and brain can scarcely process. Of course it’s absurd to say it’s thinking for itself; there are skilled computer technicians, paid good wages, working in out-sourced companies in Los Angeles, Montreal, Sydney, etc, that are making the decisions. But each decision, or programme, they make is the inaugural motion-setting of the beginning point of a permutation, which the computer then ‘runs with.’ A permutation is defined as this: If something can be chosen, or can happen, or be done, in m different ways, after that has happened, something else can be chosen in n different ways, then the number of ways of choosing both of them is m . n. That is to say an enormous number that so quickly results from the one or two. In other words, when we see these movies we are witnessing an entirely new order of automated simulation, because while the technicians set the programme the imagery we receive on the screen is the result of a vast, extraneous (permutational) selectivity which is the computers ‘getting it’ so to speak, and then ‘how about thissing it’ as they continue to generate imagery even the technicians couldn’t have imagined. And how mind-meltingly beautiful these images are! Wondrous, unimaginable combinations of colour and movement, complex, creamy, and organic. The critics are right, these animations are extraordinary unique growths of twenty first century mediated culture. Like the freakishly beautiful funghi that cling to the trunks of trees in the pitch black winter rainforests, their appearance at this period of history defies easy explanation. Unlike the forest funghi though, they are not poisonous. That is to say the trip ceases once the end credits begin to roll, and it would seem that I haven’t really said much about How to Train Your Dragon 2 at all. The technology of raw imagery may have mutated cosmically, but the art of narrative has seen no such advance. The movie is diverting enough, but it does make me wonder if Scottish viewers get embarrassed by fantasy movies constantly working the stereotypes of happy highland life in medieval Scotland; why not draw the inconography from Viking settlements in 9th century Hungary, or Lombard village life in Northern Italy? But as long as the kids are entertained. This entry was posted in Chris Palazzolo, Dean DeBlois, Dean DeBlois' How to Train Your Dragon 2, How to Train Your Dragon 2, Issue 15 and tagged animated movies, Disney, Fantasia, Terminator by gallipus. Bookmark the permalink.